Summer is here, the gardens are all planted and the flowers blooming so it must be time for the Wisconsin State Shop Hop! You have through June 30th to travel around the state. The state was broken out in eight sections this year and I know I won’t be able to complete a section, but I do plan to hit the road and visit a few. Quilt Market was in May and can’t wait to see all of the new products….if you haven’t seen the fabric for this year’s hop they have it all posted on the www.wisconsinquiltshophop.com website. There are a few shops that have posted their projects which are all so very cute. This was the year for challenge and the “bags” were going to be the monthly challenge. Took a break and completed some of those projects on the back burner that became sizzling hot and needed to be completed so now back to bags and this month was “Practical Project Bags”. Pattern Simply Sewn by Jane Sparrell @ RickRackandPolkaDots.com. They’re cute and very easy to make. And if you can’t find in your favorite quilt shop, you can purchase and download from the website. 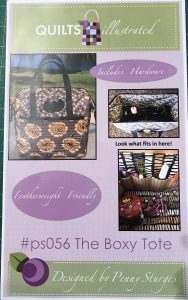 For those of you Featherweight lovers, the next bag challenge is called “The Boxy Tote”. 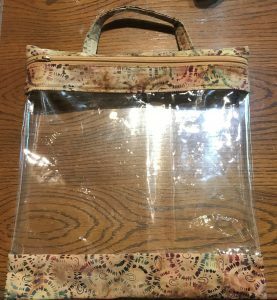 A bag to carry your Featherweight comfortably or if you don’t have a Featherweight, the bag stores and carries all of your sewing needs in an organized fashion. Pattern designed by Penny Sturges and when you order the pattern, it comes with the hardware, so you will be all set to sew once the pattern arrives or as you’re traveling you can look for it at quilt shops along your journey through the state on the hop. If you have a group of friends that would love to make it but would like some guidance or assistance….let your quilt shop know and I’m sure they would love to schedule a class. If wool is your passion….Farmhouse Threads is a great website. She organizes the weekly seasonal Mysteries with other wool designers. She’s also posting a “free” project you may download from her website and kits for these projects are also available for purchase through her website. www.farmhousethreads.com. These projects are small so if you’re just getting into wool or want to practice your embroidery stitches on a small project, they’re perfect! Her latest “Penny Candle Mat” is so sweet. These are great projects to take with you waiting (car repair, doctor office, etc. ), riding in the car, or just sitting outside relaxing. If you’re looking for a new sewing machine, hold on just a bit longer. Joe at Quilt Elements in Ashland is in the process of becoming a new Babylock distributor for the area and when he returns from training would love to show and tell you about these wonderful machines. Did you know….according to the laws of aerodynamics, the Bumble Bee can’t fly? His body is too heavy for his wings, but shhhhh, he doesn’t know this fact and flies anyway. And, they carry pollen and nectar equal to their own body weight to help sustain the rest of the colony. I’m so glad no one has told the Bumble Bee he cannot fly and they don’t have enough strength to carry their load! So proud of them, I’m making a bee quilt and I found the perfect place to begin. “Save the Bees Block of the Month” by www.Jacquelynne Steves.com She’s starting the program in August and it runs through December but you must go to her website to sign up. That’s all you need to do! Enjoy this wonderful life and never let anyone tell you you can’t do it! Of course you can, just do it, think of the Bumble Bee! Hope you’re all having a wonderful summer so far!